Jenna Williams, a half Korean, half black American, is a brilliant academic and linguist in the USA. Her area of expertise is foreign affairs. Her special interest is North Korea because this is where she believes her twin sister, Soo-min, was abducted to twelve years previously after being snatched from a South Korean island. Jenna’s perpetual search for her twin brings her to the attention of the CIA. They recruit and train her in the belief that they can use her talents and background to learn more about the secretive regime in North Korea and its leader Kim Jong-il. Jenna hopes that being a CIA operative will help her to find and rescue her twin. Two other stories run alongside Jenna’s story. Both are based in North Korea. Eventually, all three narratives become interwoven with each other. The first story is that of a delightfully feisty, elderly lady called Mrs Moon. She works on a penal farm and her innate sense of justice tends to lead her astray and bring her to the attention of the ubiquitous Bowibu – the secret police. One day Mrs Moon discovers some chocolate treats that have been sent over the border from the South. She takes them to market and uses the money she makes selling them to set up her own market stall at the nearby station. She soon becomes the leader of the other lady traders. Unfortunately, Mrs Moon’s inability to stand silently by and witness injustice gets her into serious trouble. The second story is about Cho, a wealthy and privileged member of Kim Jong-il’s elite officialdom. Cho has a wife and young son whom he adores. Sadly, being a member of the elite does not protect Cho and his family from the same terrors experienced by the peasants. When Cho learns his superiors believe that he and his brother are descended from a traitor – a father they never knew – they fully understand what horrendous trials are in store for them. 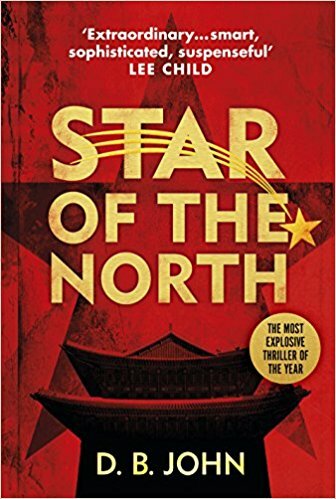 Star of the North is a brilliant book. It is beautifully written and provides a powerful and compulsive read. A continuous stream of insights about the hardships and fears experienced by those unfortunate enough to be isolated in North Korea is seamlessly incorporated within the chilling and thrilling narrative of Jenna’s determined efforts to find her twin. Facts and fiction are combined so effortlessly that it is just as well that DB John has included a section at the end of the book to enlighten us where one ends and the other starts. If you want to know how the three stories gradually merge into one, or if Jenna ever manages to rescue her twin you will need to read the book. I can’t recommend it highly enough.